Giuseppe Foti is an Italian photographer based in the United Kingdom. His aesthetic is based on his love for simplicity, minimalism and beauty. Constantly travelling, Giuseppe explores the globe in search of his next photograph.To achieve his photographic vision, Giuseppe prints his images in black and white, favouring misty weather. He shoots his photographs using long exposures and a square aspect ratio, finding this emphasises line and shape and simplifies his compositions. Giuseppe’s love for photography began during a family holiday to Turkey where Giuseppe, fascinated by the landscapes of Cappadocia, decided to try and learn how to capture the beauty of the world. 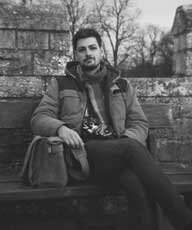 Currently living in York, Giuseppe is available for one-to-one on location tuitions and commercial jobs around the globe.